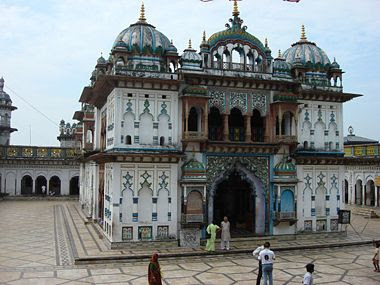 Janaki Mandir (Nepali: जानकी मन्दिर) is a Hindu temple which is at the heart of Janakpur, Nepal. It is dedicated to goddess Sita. It is an example of 'Hindu-Rajput' architecture. This is considered as the most important model of the Rajput architecture in Nepal. The Janaki Mandir was built by Queen Brisabhanu Kunwar of Tikamgarh from central India in AD 1911, at a cost of Rupees 900,000. In local parlance, the temple is also called Nau Lakha Mandir or Temple of Nine Lac Rupees.